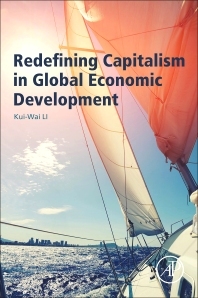 Redefining Capitalism in Global Economic Development reconsiders capitalism by taking into account the unfolding forces of economic globalization, especially in Asian economies. It explores the economic implications and consequences of recent financial crises, terrorism, ultra-low interest rates that are decades-long, debt-prone countries and countries with large trade surpluses. The book illuminates these economic implications and consequences through a framework of capitalist ideologies and concepts, recognizing that Asia is redefining capitalism today. The author, Li, seeks not to describe why nations fail, but how the sustainability of capitalism can save the world. 6. Economic Relativity: The Ultimate of Capitalism? 9. The 2008 Crisis: The World’s Turning Point? 11. Canada: Becoming a Model Economy? 13. East Asia: Flying Geese against Wind Current? 18. The Hong Kong Economy: The Pivot of China? 21. How Can Capitalist Economies Save the World? Dr. Kui-Wai Li lectures on the Asia Pacific economies, including the China economy and specializes in the areas of financial and economic development, industry and trade, political economy and globalization. He served as the Visiting Fellow at the Economic Growth Center, Yale University, and attended an executive program at Harvard University in 2000 and 2001, respectively. During his sabbatical months in 2010-2011, he taught a course in the Department of Political Economy, University of Geneva, and Faculty of Economics, Vilnius University in Lithuania, and visited the Munk School of Global Affairs, University of Toronto, and the Center for International Research on the Japanese Economy, University of Tokyo.